But with Europe's borders closed, more than 50,000 migrants remain in Greece waiting for a decision about their futures. Miracle is sleeping. He cannot tell me anything about the conditions in Moria camp. He is unaware of the smell of raw sewage that hangs around the entrance gate. He does not know about the fighting between migrants that insiders say breaks out on a regular basis. Luckily on Tuesday the tear gas fired by police at young migrants throwing stones never reached him. He does not have to stand in line for hours to get food. Miracle is just 10 months old and is strapped to his mother's back. She tells me her name is Blessing. She says she is Nigerian, a Christian from Kano, and that she left because of the Islamist militants, Boko Haram. I have no way of independently checking her story. 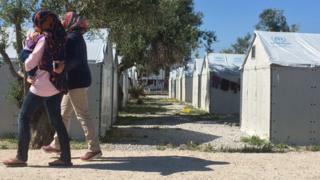 But here she is in Moria, once a transit camp for migrants, now since the EU deal with Turkey, a detention centre, run by central government. There are several thousand people inside even though it was never built to house so many. It is another sign of how Greece was simply overwhelmed by the numbers who came, while itself in the middle of an economic crisis. Most of those who arrived before March 20, the start of the EU-Turkey agreement, are free to come and go, but cannot leave the island. Those who came after that date are locked in, waiting for a decision about their asylum claims. Moria's chain link fence, topped with razor wire, snakes on its way up into olive groves. It surrounds a collection of converted shipping containers, large white plastic shelters and small tents. I meet one man who says simply, "in here, I fear for my life". Five minutes drive away, another camp. There is no razor wire, no police guarding the gate. The first thing I see is an electronic display board. It reads "the camp director wishes you a pleasant and safe stay". There are orderly lines of white UN refugee agency tents. Children run up and down the pathways between them. This is run by the council, for migrants who arrived before the 20th, and for the vulnerable: families with children, pregnant women and the disabled. They can leave the camp, but not Lesbos. One aid worker tells me it is the best camp he has seen. It sits on top of a hill, surrounded on three sides by the Aegean. In the distance lie the ruins of a castle. The facilities may be better and site picturesque, but those who I meet inside tell me it is still in effect an open air waiting room. Amiyah is 19 and from Damascus. The rest of her family are in Germany. But she cannot join them. Abdul, who is 16, complains about the food and says everyone is getting sick. Tareq tells me he had only €50 left after paying a smuggler, but yesterday even that was stolen. The Plaza is an eight storey hotel not far from the centre of Athens. It has three stars and more than 60 rooms. There are more than 140 guests, but none of them have to pay to stay. The hotel was a casualty of the economic crash, going bankrupt in 2010 and closing its doors. But last Friday a group of activists and former workers unlawfully reopened the Plaza, with migrants as guests. The reception is manned by volunteers 24 hours a day and the kitchen turns out food. There are more than 70 children staying here. When we visit there is laughter and singing from the playroom on the first floor. And in a rack by the entrance, yellowing maps of Athens still waiting for the tourists who never came.